Nursing can be a career for life. You can also become a nurse later on in life if you decide that a career change in this direction is definitely for you. There are many nursing jobs and roles available to suit a host of people with a variety of skills. However, the common role of a nurse is to tend the needs of the patient, rather than the illness, disease or condition. Nursing is not restricted to hospital work, and does not necessarily involve dealing with blood, guts and gore! Once you have completed your pre-registration course, there is a multitude of module options available, so that you can choose the direction and area of healthcare that you'd like to work in. Nurses can work in patient's homes, in schools, with children, the elderly or those with mental disabilities, as well as in prisons or GP practices. The opportunities in this area are extremely varied, each with their own set of challenges and rewards. What Skills or Qualifications Will I Need? Before working in the NHS, you will need to complete a pre-registration course. There are many pre-registration courses available throughout the UK, and at present there is no set minimum entry qualification across the board. The entry requirements differ depending on the higher education institution chosen. It is generally thought that most entry criteria for a diploma course will require candidates to possess around 5 GCSEs (or equivalent) of Grade C and above including English literature or language and a science subject. Nursing degree courses usually require candidates to have gained at least 2 A-Level qualifications or equivalent. If you're considering Changing Career and becoming a nurse, you should have good numeracy and literacy skills. You should also be an excellent team worker and possess good communication skills. You may also find that you have to work within extremely emotionally charged atmospheres and situations, so an ability to work and communicate calmly, sympathetically and efficiently within such situations is crucial. Observation skills are also vital, as a nurse's role can often include monitoring a patient's progress, as well as the possible resulting care routes. You could start working as a healthcare assistant or in a medical or health support role, which may not require you to possess any formal qualifications, before working your way up to a level where you can apply for a degree course. Some applicants may prefer to take the route of simply going straight to a University Course to study as a nurse. The NHS tries to encourage applicants of all ages and backgrounds, by offering bursaries and paying tuition fees. You may be surprised to find that you're eligible, so make a point of checking this point out. If you've never worked in a healthcare environment before, it is always a good idea to try to gain some level of work experience. Work experience can also include Working In A Voluntary Capacity for organisations such as St John Ambulance. This will not only provide you with an insight and experience into certain aspects of nursing, but also go a long way in showing that you are committed to a career change in nursing. There are also many different pre-registration programmes to choose from to suit your needs. If you are only able to study part-time, there are many university courses available that will take around five or six years to complete part-time. This career route is available for staff working within the NHS, most commonly those who have gained an NVQ Level 3 working as associate practitioners or assistants. If you have been qualified in the past with a health-related degree, or are returning to a career in healthcare, there are also opportunities to undertake an Accelerated Programme for around 2 years. However, these can be restricted to certain universities, so it is best to check out UCAS for more details to see if this route will suit you. Whatever your situation, the likelihood is that there is a nursing job and career route out there that will meet your requirements, making a career change in nursing a completely viable option. You may also wish to consider other careers in the health industry, such as a Paramedic or a Midwife. Hi I am 41 years old and always had a career within retail but always longed to be in a job that was more rewarding for quite a few years now I’ve wanted to work within the local NHS hospital but never thought I could do it due to me only having the basic gcse qualifications and no funds to go onto university to study nursing , At this time in my life, now my children are older I would really love to pursue this even if I just started off as a support worker on the wards. Is this possible ?? Hi; I have got NVQ 7, does it help to reduce the time of qualification to become Nurse. Hi, I’m currently a HCA working in a busy nursing home on an EMI unit I really want to progress up and become either a nurse or a midwife would love to do both I don’t have great GCSE’s wonderIng how I can go around progressing. Hi i am currently working as HCA at a GP practice, I wish to go into nursing and become a practice nurse at a GP, my question Is do i have to go into university to get a degree for nursing or is there any other courses I can do which will take less than 3 years? Is there an upper age limit for nurse training? Are there any exemptions for nurse training? I have a social science degree and have had a long career as a qualified social worker. You may need to get the next level (NVQ 3) of qualification before being considered for a nursing degree or nursing apprenticeship as that's the usual entry requirement. The NHS careers website will help. A levels are a good way to get on to a nursing degree if you do not already have nursing qualifications or are not currently working in a healthcare/nursing related job. I am 25 I've been working in pharmacy for 5 years now I have a qualification in healthcare , nvq2 dispensing of medicines & just about to qualify as a pharmacy technician (nvq3) I'm going on to do my accuracy technicians course and register with the gphc !! However I am interested in nursing what would my next step me if i was do look at this in the next year or two ? Hi, i'm 15 years old and wondering how i can become a oncology nurse after i leave school. I've been told about various ways to obtain an apprenticeship and degrees but i'm not sure on how to access them. I'm looking at changing careers. I currently work full time in an office environment but would love to become a nurse. Previously I have spent numerous years as a Care Assistant. This was my passion as I loved helping people & always tried to make a difference. I had my children very young and am now 43, is this too old to train to be a nurse? Also how would I go about this as I am not financially in a position not to work. 43 is not too old. 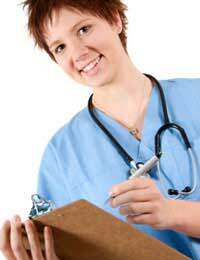 Usually the only way to become a nurse is through completing a nursing degree. There are some on-the-job training options available - for example if you start work as a nursing associate, you may have the option to move to a nursing apprenticeship and complete the degree that way. Check with the NHS to see if there are any funding options for someone in your situation. I'm 17 and would like to become a nurse. I have good GCSEs, but I'm not sure if I have to get a degree or whether I could do an apprenticeship in dental nursing which would give me the qualification I needed to get on the nursing course? Is the only way to become a nurse to do the full nursing degree? Yes usually the only way to become a nurse is through completing a nursing degree. There are some on-the-job training options available - for example if you start work as a nursing associate, you may have the option to move to a nursing apprenticeship and complete the degree that way. Working asdental nurse may not give you the relevant qualifications to get on to a nursing course. As you're still young, it's might be worth considering doing your A levels and a nursing degree after that. Talk to your school or college careers adviser. You can get a student loan while you study and there may be additional burseries available. The NHS Careers website is probably the easiest way to find out. hi i would enquiring ihave applied to uni and been put in the clearing i have my nvq level 2 and 3 in health and social and have level 1 in maths and english will that be enough to meet the requirments. Hi, I am looking to change careers into the medical profession. My end goal is to become a registered nurse, specifically for emergency or A&E. I have no idea where to start in this. I am from the US, where I received my BSc before moving to London and earning my MSc. I had an EMT certifications from the US, but has expired, yet I have had the experience of working in the field for my clinicals. I would like to work in a health care role while obtaining my nursing credentials. Just don't know where I should start, what certifications or qualifications I can or should obtain in the short-term or what career route I should go after. Any advice on the matter would be much appreciated. Thnx!